The soon-to-be cleaned steps and newly restored frescoed stairway will be unveiled on 11 April, the week before Holy Week, during a special blessing ceremony at the Sanctuary of the Holy Stairs. The marble steps were going to be left open to the public temporarily before the original and restored wooden panels would be put back on. The Holy Stairs with concave indentations from years of wear from pilgrims are seen at the Pontifical Sanctuary of the Holy Stairs in Rome March 15, 2019. 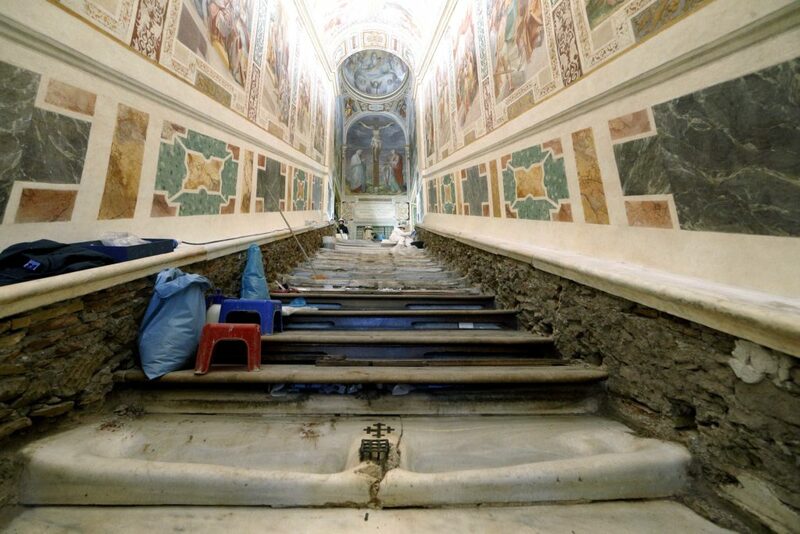 Vatican restorers have removed the wood covering the stairs, which tradition maintains Jesus climbed when Pilate brought him before the crowd. Pilgrims will have the opportunity to climb the bare marble stairs for at least a month after an April 11 unveiling of the renovated sanctuary. Photo: CNS/Paul Haring. The decision was made during one of the final phases of the sanctuary’s restoration – a 20-year-long project overseen by the Vatican Museums and funded with the help of private donors, foundations and the Patrons of the Arts in the Vatican Museums. Paolo Violini, the Vatican Museums’ head fresco restorer, and his team were so astonished and moved when they saw the degree to which the stone steps had been worn away, he felt this hidden testimony of faith had to be seen and experienced – even just temporarily – by today’s faithful. “It’s an extraordinary occasion to touch the same steps as Jesus and witness the faith of all the other people who came before us,” the sanctuary’s rector, Passionist Father Francesco Guerra said. 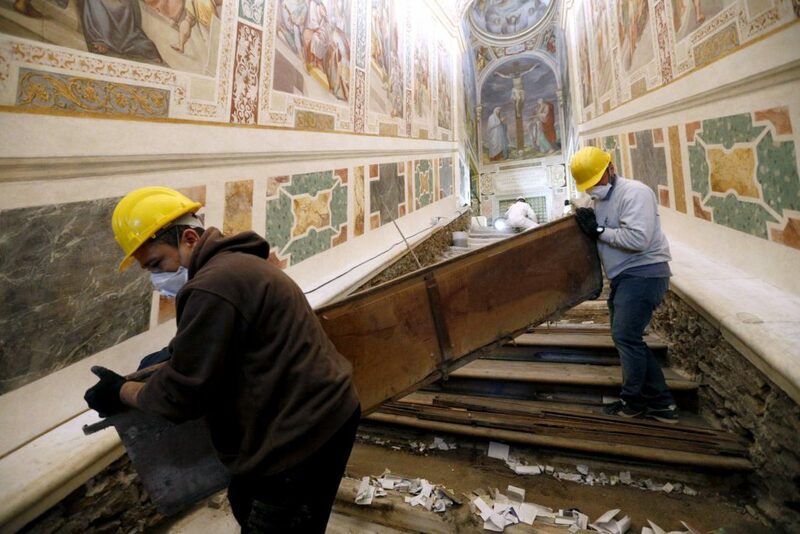 Notes from pilgrims are seen as workers remove a wooden covering over the Holy Stairs at the Pontifical Sanctuary of the Holy Stairs in Rome March 15, 2019. Pilgrims will have the opportunity to climb the bare marble stairs for at least a month after an April 11 unveiling of the renovated sanctuary. Photo: CNS/Paul Haring. Since then, millions of people climbed the steps on their knees, slowly and unintentionally digging deep undulating ruts and furrows into the soft stone. One of the 28 steps was so worn away by people’s shoe tips, a hole had been bored straight through the thick slab of stone. That happened, Mr Violini said, because that was the step where pilgrims lingered longer, to lean down and kiss “the most important step” above, which is cracked down the middle and adorned with a metal cross and a raised metal grate. According to tradition, Jesus fell at step 11, cracking it with his knee. The cross marks the point of impact, Mr Violini said, and the open grate covers what was said to have been a spatter of his blood. A worker points to the Holy Stairs during restoration work at the Pontifical Sanctuary of the Holy Stairs in Rome March 15, 2019. 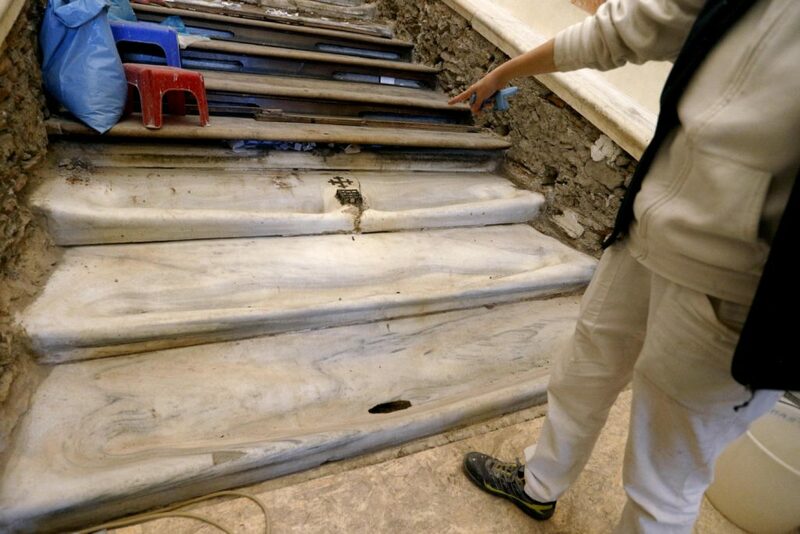 Vatican restorers have removed the wood covering the stairs, which tradition maintains Jesus climbed when Pilate brought him before the crowd. Pilgrims will have the opportunity to climb the bare marble stairs for at least a month after an April 11 unveiling of the renovated sanctuary. Photo: CNS/Paul Haring. Up until now, people had only been able to see – not touch – these areas through small glass panels in the wooden treads. Notes from pilgrims are pictured after a wooden covering was removed over the Holy Stairs at the Pontifical Sanctuary of the Holy Stairs in Rome March 15, 2019. Pilgrims will have the opportunity to climb the bare marble stairs for at least a month after an April 11 unveiling of the renovated sanctuary. Photo: CNS/Paul Haring. 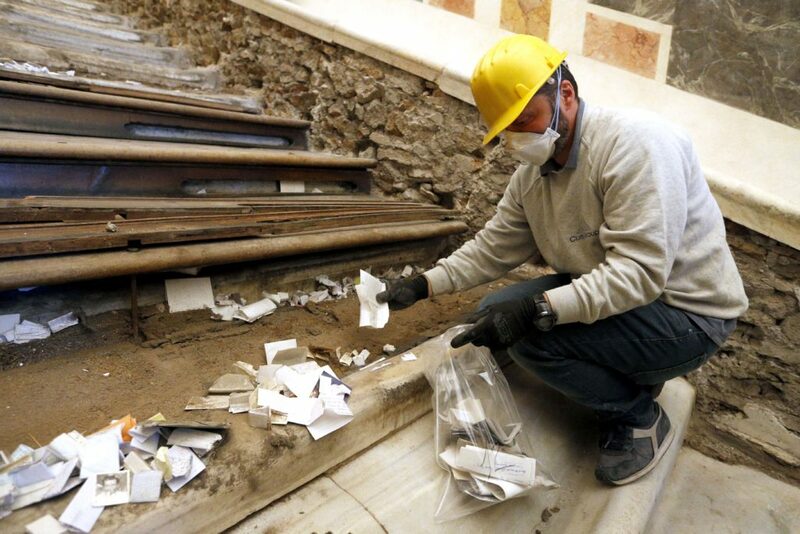 A worker collects notes from pilgrims after wooden coverings over the Holy Stairs were removed during restoration work at the Pontifical Sanctuary of the Holy Stairs in Rome March 15, 2019. Pilgrims will have the opportunity to climb the bare marble stairs for at least a month after an April 11 unveiling of the renovated sanctuary. Photo: CNS/Paul Haring. 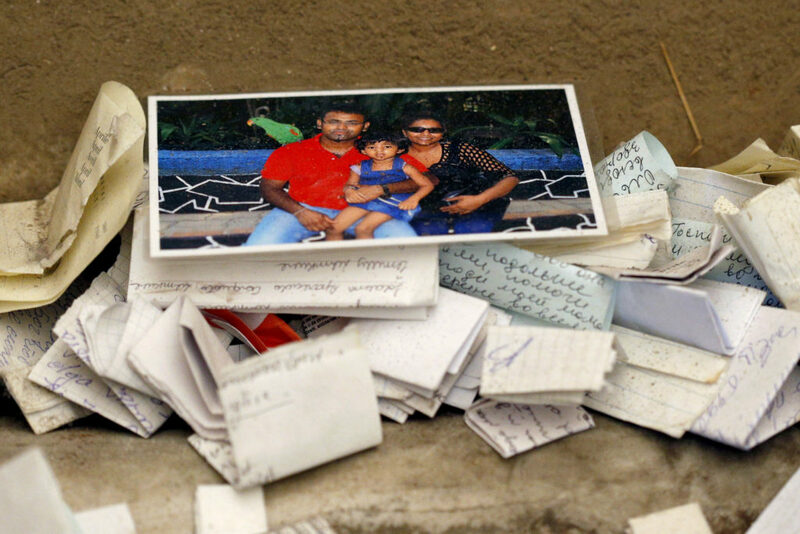 Workers carefully bagged the written prayer requests and mementos, which had been stuck into the open slats in the stair risers. They were to be given to the Passionist Fathers in charge of the sanctuary for cataloguing and study. The objects date back to no earlier than the 1950s, Mr Violini said, which has led the restorers to believe the stairs had probably been cleaned for the Jubilee Year of 1950. 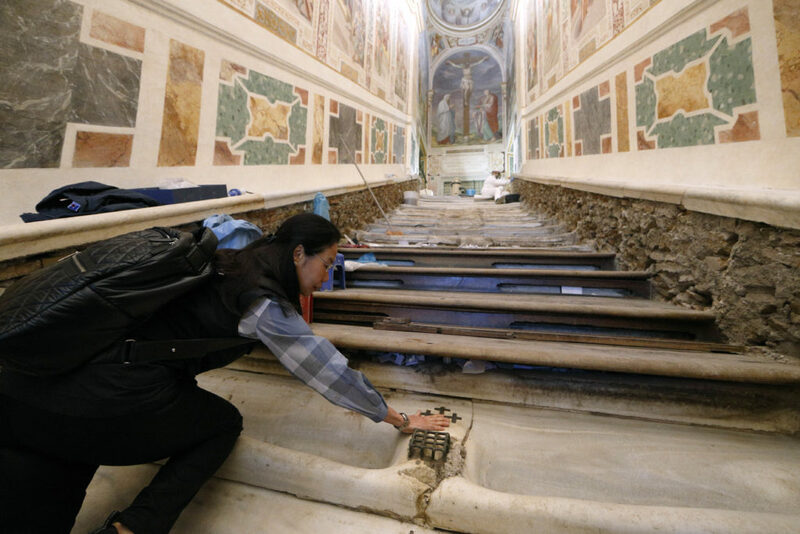 Mei Wen of Perth, Australia, touches an area of the Holy Stairs where Jesus is believed to have fallen, during restoration work at the Pontifical Sanctuary of the Holy Stairs in Rome March 15, 2019. Wen is one of the major donors who contributed to the restoration of the sanctuary. Pilgrims will have the opportunity to climb the bare marble stairs for at least a month after an April 11 unveiling of the renovated sanctuary. Photo: CNS/Paul Haring. She explained that she became a major donor to the stairs’ restoration after she and her husband first climbed them in 2013.